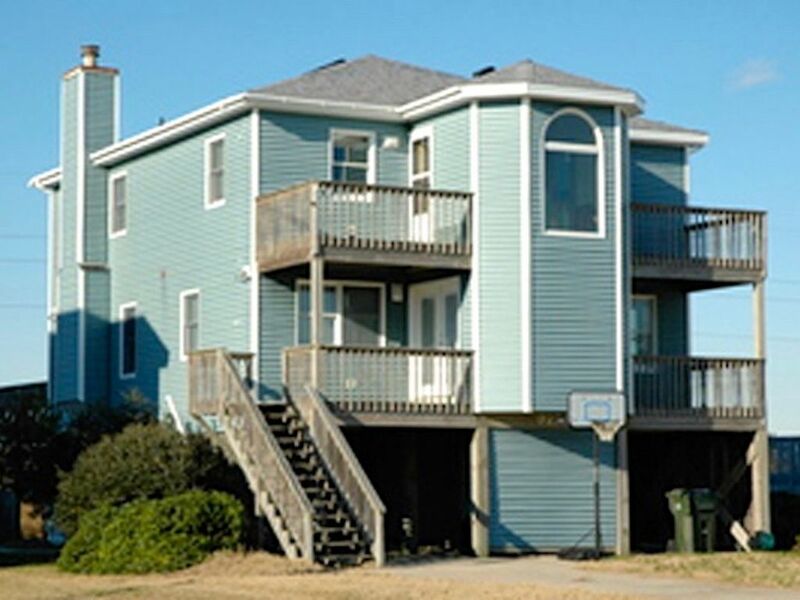 Located at the 19 mile post in South Nags Head, this spacious 4 bedroom, 4 bath has easy access to the beach (240 Ft. to June St. Beach Access, about a 3 minute walk), comfortable furnishings, decks to the east and the west, and spectacular sunsets from the hot tub. The house is comfortably furnished and ideal for families with a nursery located off the king bedroom and bicycles downstairs. Located in South Creek Acres your family will enjoy the private road parallel the beach road perfect for biking and walking, a large community swimming pool and tennis courts. The access at June Street offers wide secluded beaches. Ground Level: Parking for 4 Cars, Ground Level Entry, Charcoal Grill and Enclosed Outside Shower. Mid Level: Living Room, Dining Room, Eat in Kitchen and separate TV/foosball room, DVD, Sound Views, Bedroom w/Queen and Full Bath, West Facing Deck with Hot Tub and Patio Furniture. Top Level: 3 Bedrooms 3 Baths; King Bedroom with Full Bath and attached nursery with crib, rocker and single bed, 1 w/Queen and Twin with full bath, 1 w/Full/Twin Bunk and twin Bunks. All bedrooms have cable television and ceiling fans. Two East Facing Decks with patio furniture. Washer and Dryer. Arriving early? No problem the house has keyless entry. Just call when you arrive on the beach enjoy the South Creek Acres Community Pool and we will call you when your house is ready. Features Include: Bed Linen Provided, Central Heat and Air, Washer/Dryer, Dishwasher, Microwave, 6 TV, 3 DVD players, Wireless Internet, Ceiling Fans. This is a Non-Smoking House. Located at the 19 milepost in South Nags Head, the house is within a short distance to many local attractions, while escaping the crowds of the beaches only a few miles North. The house is situated less than 3 mile North of the Park Service National Seashore. Outer Banks Pier is less than a mile away which makes for a short walk or bike ride to eating and fishing. Other places of interest within the immediate area include Jennette’s Pier a few miles to the north, Bodie Island Lighthouse 4 mile to the South and Oregon Inlet, one of the premier fishing and beach driving locations in the area, about 6 miles to the south. Groceries and Restaurants are 2 mile North. Price does not include the 13% occupancy taxes; No Pets. I am the manager at Geri's Place Cottages. I have been running the cottages for my Mother in Law Geri McManus since 2003 when she semi-retired. My husband Patrick was raised here at the cottages and we are now raising our two children. We love it here in South Nags Head and we enjoy seeing the same families come back year after year. We just purchased the house in South Creek Acres from Patrick's brother who moved to Florida. If I am not in the office when you call I am probably out at the pool, playground, or surfing with my family. We just purchased this house in 2014, it offers so many fantastic options to families coming to the beach we thought it would be a good addition to the cottage court we rent at the 21 milepost. Great place and location. Will return soon! This house is great for families. Perfect location. When we arrived the house actually over exceeded our expectations and the pictures dont do it justice. All the kitchen supplies are new and the house was very clean. We would rent this place again. This house has a great set-up for families. Our boys are grown and married so there were plenty of rooms for 3 plus couples. The big plus was the king master with the child/nursery attached including a crib and twin for the younger children to be near mom and dad. Master bedroom and bath large for all the necessities of dealing with small children. Plenty of roomy bathrooms; large eat-in kitchen plus a dining room. Owners friendly and helpful and answered email questions in a quick timely manner. Very prompt to refund the difference in our stay when we were required to evacuate due to hurricane. Very close to beach access and community pool was clean but did not have lounging chairs, just a few benches built in. House was neat and clean overall but showed some signs of needing a good "spring cleaning" or fresh paint. Kitchen roomy and stocked with most needs but found a few items lacking especially in area of cooking utensils (no spoons for stirring, just spatulas) and no food storage containers. Overall it was great! I would, hope to, stay again and I would recommend it to anyone. Cancellation with more than 30 days deposit is refunded minus $100. Cancellation with less than 30 days deposit is not refunded minus $100 unless the house is rented.